Authorities continue to probe into the business activities of Italian businessman, Matteo Quintavalle, following last month's charges of fraud filed against him by his American investors. Quintavalle, weeks before the filing of the charges, had his accounts closed by the Banco de Costa Rica. Yesterday, the Organismo de Investigaci�n Judicial (OIJ), raided Quintavalle's home in Escaz� and in Quepos, when police arrived at 6:30am at the hotel Terran�. Police searched both properties looking for evidence to support the charges made by the 17 investors who say they are concerned about their investment and asked authorities to intervene. Quintavalle has become a controversial figure during the last couple of months. Quintavalle first appeared in the public scene with his purchases of local football (soccer) players contracts after having expressed in purchasing a local team which never came to be. The Italian was able to sign up key players like Wilmer L�pez, Kurt Benard andy Allan Alem�n, among others, making headlines of his presence in the Costa Rican business world. 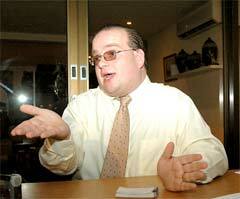 However, shortly after the decision by the Banco de Costa Rica placed Quintavalle back in the headlines, this time with the news that the bank had closed his account, for irregularities regarding his 11 accounts and businessman announces his move to the Banco Nacional and threatens to sue the BCR. Quintavalle's banking problems prompted an investigation by the Ministerio de Hacienda (Revenue ministry) delving into the financial transactions of Quintavalle. That investigation made investors nervous who took action against Quintavalle by filing charges of fraud with the Fiscal�a (prosecutor's office). Quintavalle has said publicly over and over that he has nothing to hide. However, authorities this week decided to take the next step and find that our for themselves. �2002-2007 Insidecostarica.com. All rights reserved.